Creating an agritourism destination isn’t all fun and games — though it’s certainly helpful to provide a huge variety of fun and games. Developing Long Acre Farms from a produce and crop farm to an agritourism site that draws visitors from hundreds of miles around has taken 25 years. These days, the agritourism has outstripped the crop and vegetable farming as its claim to fame. In fact, Long Acre farms only 20 acres and rents the rest. Long Acre grows specialty pumpkins, produce to sell in the farm market and grapes for its winery, JD Wine Cellars. Opened in 2010, the winery produces 20 kinds of wine. But the best-known crop on the farm is the five acres of corn grown for the Amazing Maize Maze™, the first in New York. 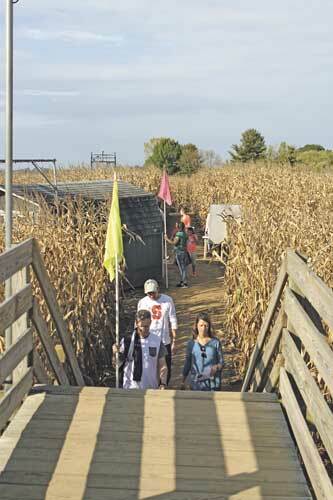 This past year, the corn maze theme was “20 Years of Twists and Turns” to celebrate the maze’s 20th anniversary. The maze design also depicted the fourth generation on the farm, Sarah Henning, who is co-owners Doug and Joan Allen’s daughter. She returned to work on the farm full-time. “If you look at the picture it is basically four mazes within one maze,” Joan said. The upper left corner featured a windmill representing Joan’s grandparents, Arthur and Dora Lawrence, who started a diverse farm in the 1920’s. It became known as Long Acre Farms because many of the crop fields measured over a mile long. The second quadrant was for Joan’s parents, Harlan and Charleen Larwence, who shifted from dairy and farmed about 1,500 acres of vegetables and crops in the 60s and 70s. The third quadrant symbolized Doug and Joan, who started the seasonal farm market, gift shop, ice cream stand, maze and agritourism aspects of the farm. The fourth featured a large question mark representing Sarah, the fourth generation. “We don’t know what the farm may look like in the next 20 years,” Joan said. The center of the maze depicted the number “20” for the number of years the farm has featured a corn maze. It’s currently the second longest continuously operated corn maze in the world. Henning is just following her mom’s example of innovating on the farm. Joan said that Long Acre introduces new features and activities to keep the farm’s experience one that draws visitors back year after year. This year, Long Acre introduced its newly remodeled market. Joan said that the farm combined two buildings into one heated, air-conditioned facility. The farm employs about 35, not counting family, during the busy season, and two full-timers during the off season, except for part-timers that help with winter events. With new help comes new ideas. Sarah and her husband, Matthew, moved back to the farm last September. Sarah manages on the farm and Matthew works off-site. Joan said Sarah suggested wood-fired pizza as another food option for visitors. That meshes will with the farm market and the local foods movement. Since the farm features so many children-oriented activities — including multiple pieces of playground equipment, corn gun, pumpkin gun, jumping pillows, mini maze, pedal cars, petting zoo and more — the addition of the winery has brought in additional income for the farm. The Tasting Room inside JD Wine Cellars offers samples of its wines: classic viniferas, hybrids and fruit wines. The winery also creates an upscale connection to yet another branch of the business: public meeting space. Long Acre remodeled a former hay barn in 2001 for a site suitable for corporate meetings, weddings and reunions. The Party Barn can host up to 600. “We’re getting more requests for weddings,” Joan said. Especially considering the rustic wedding trend, it’s easy to see how Long Acre is hosting more weddings. This year, Long Acre added a patio to the facility. Long Acre had tried getting into wine before, but the farm hadn’t established itself as a winery and it didn’t fly. Becoming an agritourism attraction isn’t right for every farm. Joan said that farmers must be willing to have the public walking their acres. Public perception of farm venue also makes a difference in how they experience their time on the farm. Some visitors from more urban areas don’t tend to understand what to expect from a farm venue. Joan said some think it will be more like an amusement park with a farm slant, since the farm charges admission to the play areas and maze. But the only “rides” are a hayride and a mini wagon ride through the grounds. Some think that restrooms with flushing toilets will be available, though it’s not feasible for the farm to install the facilities needed. Portable toilets suffice. Disappointment from these kinds of misunderstandings can cause visitors to leave negative social media reviews, but Joan has learned to ignore unwarranted criticism. On weekends, when the corn maze was open, parking can sometimes challenge visitors. When the Allens first opened their business to the public, they little imagined the direction the farm would go. Joan said that perhaps they should have laid out the buildings better if they had planned the subsequent expansions so that adequate parking would be on the same side of the road.